Recent revelations that a Bermuda law firm helped facilitate offshore tax avoidance has heightened awareness of the vast amount of income and wealth flowing into tax and secrecy havens worldwide. The countries through which this firm helped funnel global elites’ assets also act as tax havens for multinational corporations. 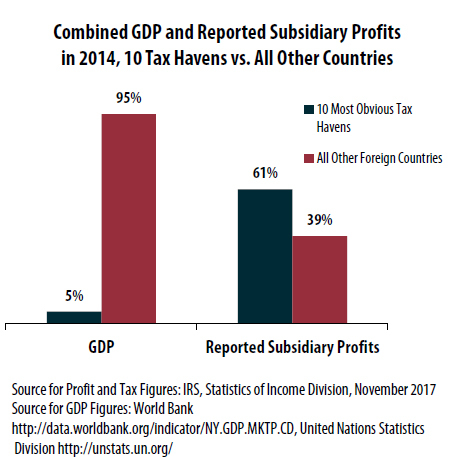 Recently released data from the Internal Revenue Service show that U.S. corporations claim that 61 percent of their foreign subsidiaries’ pretax worldwide income is being earned in 10 tiny tax haven countries. The table below shows how much profit American corporations collectively tell the IRS that their subsidiaries have earned in each foreign country. Amazingly, American corporations reported to the IRS that the profits their subsidiaries earned in 2014 (the latest year for which data are available) in Bermuda, the Cayman Islands, the British Virgin Islands, the Bahamas and Luxembourg were greater than the entire gross domestic product (GDP) of those nations in that year. For example, in Bermuda, U.S. corporations claimed they earned more than $17 for each $1 of actual GDP. Besides reporting profits that dwarf the entire GDP of countries such as Bermuda and the Cayman Islands, it’s easy enough to surmise that corporations are also using less-obvious tax havens to shield their profits from U.S. taxes. For example, American corporations report to the IRS that profits their subsidiaries earned in Switzerland were equal to 7 percent of that country’s GDP. This is a much higher share of GDP than the profits reported in European countries with larger economies. For example, corporations report that their profits in Germany and France are equivalent to about half a percent of their respective GDPs, and they report that profits in the United Kingdom are equal to about 3 percent of its GDP. This suggests that American corporations are exaggerating how much of their profits are earned in Switzerland, which is not surprising since some corporations are able to obtain very low tax rates in that country. It is obviously impossible for American corporations to legitimately earn profits in a given country that exceed that country’s total output of goods and services. American corporations clearly are using various tax gimmicks to artificially shift profits earned in the United States and other countries where they do the bulk of their business into their subsidiaries in these countries that impose little or no tax on corporate profits. The 10 countries with the highest reported American offshore corporate profits as a percentage of their GDP in 2014 had only five percent of the total GDP for all the foreign countries included in the IRS figures. But American corporations reported to the IRS that 61 percent of their offshore subsidiary profits were earned in these tax-haven countries. This is obviously impossible. The only plausible conclusion is that American corporations are engaging in various accounting gimmicks to make large amounts of their profits appear, for tax purposes, to be earned in these ten tax-haven countries. These 10 countries have either zero tax rates or provide loopholes that allow corporate profits to go largely untaxed in many circumstances. The two columns on the right side of the table on above show the amount of corporate income taxes paid on the subsidiary profits to the country where they were supposedly earned or any other foreign country. This is shown first as a dollar figure and then as a percentage of the profits supposedly earned in that country. There are apparently foreign income taxes paid on some profits even in countries known to have a zero corporate tax rate such as Bermuda or the Cayman Islands. This may often occur because the profits are shifted from a subsidiary in another foreign country that imposes some tax on profits when they are shifted to a tax haven country. Overall, however, these subsidiary corporations are able to avoid paying almost any taxes. The effective rate of foreign taxes paid on subsidiary profits in the ten countries was only 8 percent. The United States allows American corporations to defer paying U.S. corporate income taxes on profits of their offshore subsidiaries until those profits are “repatriated” (officially brought to the U.S.). This creates an incentive for American corporations to engage in accounting gimmicks to make their U.S. profits appear to be earned in countries where they will not be taxed. The new IRS data demonstrate that this is happening on a large scale. 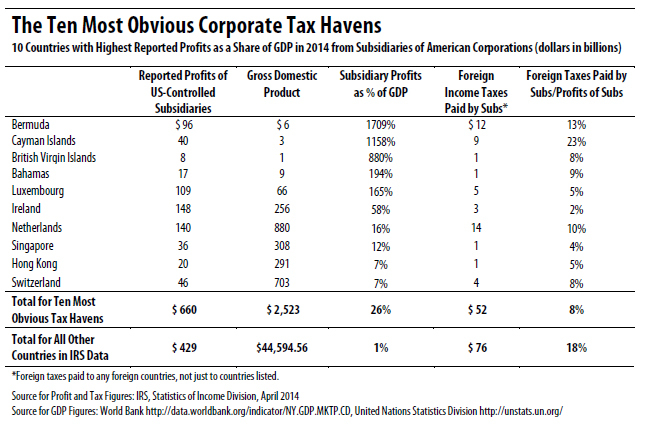 In fact, American corporations reported $660 billion of their profits in 2014 were earned, for tax purposes, in the 10 tax haven countries shown in the table above. Amazingly, many lawmakers are currently calling for even greater tax breaks for the offshore profits of American corporations. The consensus legislation from the House Republicans and the Trump Administration would largely exempt previously accumulated offshore profits from U.S. taxes on an (allegedly) one-time basis (often called a “repatriation holiday”). In addition, they would provide a permanent exemption (often called a “territorial tax system”) from taxation going forward. Perhaps these lawmakers do not realize that over half of the profits that American corporations claim their subsidiaries earn offshore are reported by the companies to have been earned in 10 obvious tax havens. Corporate profits that are genuinely earned through real business activities abroad are typically subject to substantial foreign taxes in the countries where they are earned, and if they are repatriated, the U.S. tax that is due is reduced by whatever amount of tax was paid to foreign governments. When companies report that their offshore profits are potentially subject to nearly the full 35 percent U.S. tax rate upon repatriation, this is a clear indicator that these profits have been artificially shifted to tax havens. Companies engaging in these tax-avoidance games would be the main beneficiaries of a repatriation holiday or territorial system. Congress could end offshore corporate tax avoidance in a straightforward way by ending the rule allowing American corporations to defer paying U.S. taxes on their offshore subsidiary profits. They would still be allowed to reduce their U.S. income tax bill by whatever amount of tax was paid to foreign governments, in order to avoid double-taxation. But there would no longer be any reason to artificially shift profits into tax havens because all profits of American corporations, whether earned in the U.S. or in any other country, would be taxed at least at the U.S. corporate tax rate in the year they are earned.